Issue 31: SUPER DIME STORE COMBAT ISSUE! 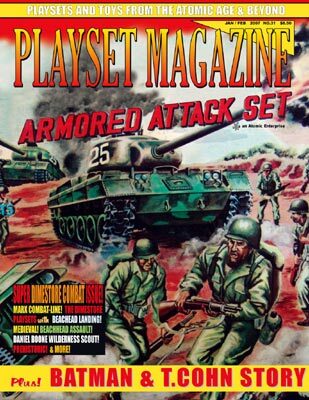 Rev up your big twin diesel engines and start the attack on the New Year with this unusually packed, big issue of Playset Magazine...Our cover is right off the carton of the Marx Armored Attack set -- this boxed gem comes with hand painted U.S. infantry, motorcycle and TWO remote controlled vehicles - a tank and a jeep! This set is from a Marxman and the nephew of Louis Marx himself! Issue 32 starts the New Year right and with a bang up toy party and you're invited! Remember the smell of popcorn and candy as you browsed the aisles of your favorite dimestore? Remember counting you dimes and quarters to see if you could afford that new toy? 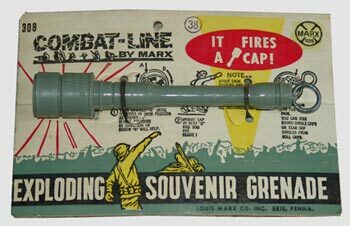 Then you might remember the Marx "Combat Line" - here's boxed sets and a line of German helmets, grenades, rifles, and sets with the GI equipment ready for battle -- you had your shot at them as a kid and now here's a swell opportunity to see them again. Now we explore "The Dimestore Sets" - a fabulous line of Marx' small playsets from the 1963 - 1964 era. We'll see "Combat Landing Force" and "Beachhead Assault" in vibrant cartons, the rare "Prehistoric" playset, "Daniel Boone Wilderness Scout" battle the Indians in several varities -- yes it's all in this issue -- and then, for your Centerspread viewing and reading pleasure we have a drenched-in-nostalgia story about the never-before-seen-in-color Batman Playset by Ideal. Pricey, rare and beautiful, this is playset connisseur David Schafer's first centerspread story and it is just loaded with detail about that set. And talk about rare! Almost nothing in this set is common or easily available -- you won't want to miss your chance to see it all, close-up and in full color! Photos are by his brother Bernie, a professional photographer whose most excellent pix are crisp and wonderful to behold. And as if all that weren't enough, we bring you the next installment of Kent Sprecher's string of stories about lesser-known makers. This time it's "The T.Cohn Story - A Superior Toy" with inside details and shots of hardly - ever seen playsets. So for a bit of a change, we've got a big "Dime Store" issue filled just like S.S. Kresge's aisles used to be with small playsets and toys that'll get your memories running right for the New Year! Remember, subscribing to Playset Magazine is easy -- and it brings you a year full of the excitement of opening those great sets again, spread out in our most colorful centerspread arrays; news, finds from around the country, vintage and new toy ads, and more.